The Research Infrastructure Improvement Program Track-1 (RII Track-1) awards are intended to improve the research competitiveness of jurisdictions by improving their academic research infrastructure in areas of science and engineering supported by the National Science Foundation and critical to the particular jurisdiction’s EPSCoR governing committee as having the best potential to improve the jurisdiction’s future R&D competitiveness. The EPSCoR governing committee in Alabama is the ALEPSCoR Steering Committee, composed of the Vice Presidents for Research and Economic Development at EPSCoR participating universites in the state, statewide industry leaders, and a representative from the Alabama Commission on Higher Education. RII Track-1 awards provide up to $20 million total for 5 years to support improvements to physical and cyber infrastructure and human capital development in research areas selected by the jurisdiction’s EPSCoR steering committee as having the best potential to improve future R&D competitiveness of the jurisdiction. The research activities of the project must align with the specific research priorities identified in the approved Science and Technology (S&T) Plan of the jurisdiction. 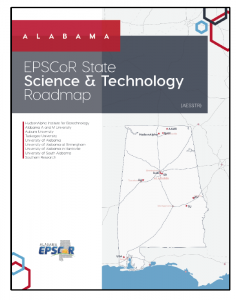 The Alabama EPSCoR State Science and Technology Roadmap (AESSTR) serves as the statewide S&T Plan and is used as a guide for the selection of RII Track-1 proposals. The AESSTR is now combined with the state strategic economic development plan, Accelerate Alabama 2.0. RII Track-1 proposals must align with the goals stated in the AESSTR and support the mission of Accelerate Alabama 2.0. Track-1 proposals are submitted by jurisdictions. That is, a competitive down-select process is employed to chose a single proposal from submissions from across the state that represent the state’s proposal for the RII Track-1 program. Individual universities and investigators are not able to independently submit a RII Track-1 proposal. Only eligible EPSCoR jurisdictions with current RII Track-1 awards that expire before October 1, 2018 and those without a current RII Track-1 award may compete in the FY 2018 RII Track-1 competition. Cost sharing is required at a level of at least, and no more than, 20 percent of the amount requested from NSF. Sub-awards to institutions in non-EPSCoR jurisdictions are not permitted. An example of a recent Program Solicitation for the RII Track-1 program, the information provided above, and additional information can be found here.